Select the employee’s title from the drop down menu. Enter the employee’s first name - this is a compulsory field. Enter middle name(s) if known. Enter the employee’s surname - this is a compulsory field. Enter the employee’s date of birth. A date of birth is required if the employee is over 66, under 16 or their PPS number is unknown. Enter the employee’s address, if known. Please note that the employee’s address is required if the employee’s PPS number is unknown. Click Add Email Address to add a contact email address for the employee. 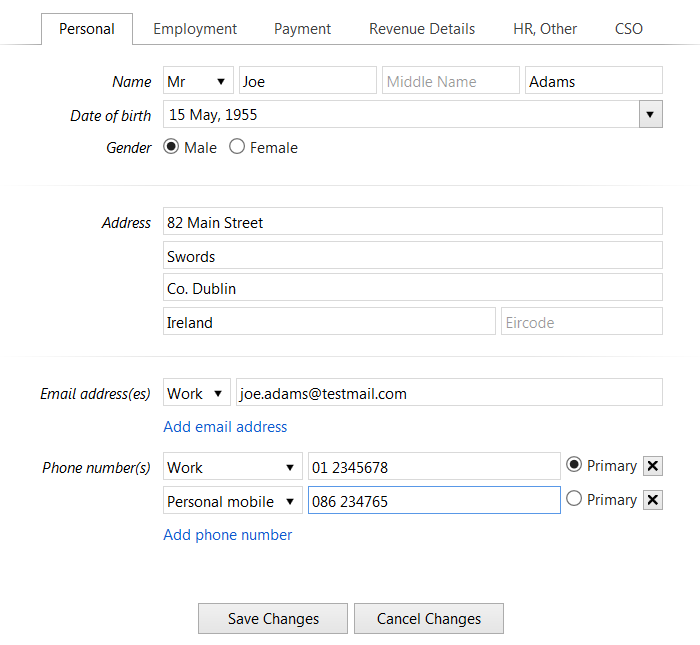 Select whether it is a work address or a personal address from the drop down menu and enter the employee’s email address. To add additional email addresses, click Add Email Address again and repeat the process. If more than one email address is added, specify which is to be the primary address. The primary email address will be used for the emailing of payslips etc. Click Add Phone Number to add a contact telephone number for the employee. Select whether it is an office, work mobile, home or personal mobile number from the drop down menu and then enter the telephone number. To add additional phone numbers, click Add Phone Number again and repeat the process. If more than one phone number is added, specify which is to be the primary contact number. The employee’s personal details are now complete. Select the ‘Employment’ heading to continue to set up the employee’s record.